Make sure you wear gloves while handling peppers! 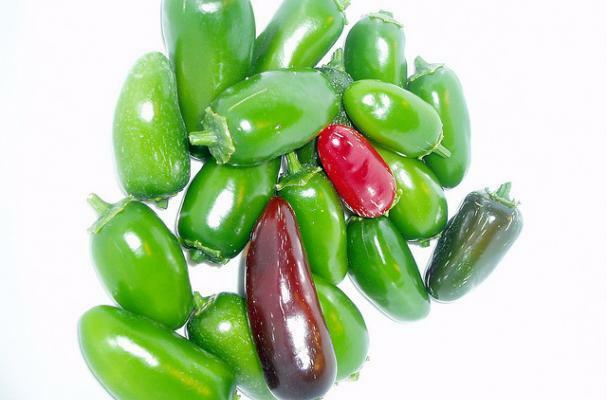 Remove seeds and stems from peppers and chop. Combine peppers, vinegar, and sugar in a large saucepan. Boil for 10 minutes, stirring constantly. Stir in liquid pectin and boil hard for 1 minute. Remove from heat and skim any foam if necessary. Add green food coloring to make it a pretty color. Ladle jelly into hot jars leaving 1/4 inch headspace. Yield: about 5 half pints. Best way to eat this is to spread cream cheese on a ritz cracker and spoon jelly onto top. The cream cheese kills the heat and brings out the sweetness and flavor of the peppers. Enjoy! Remove stems and seeds from peppers. Finely chop in food processor or blender with a few spoonfuls of the vinegar. Combine all except pectin in a large saucepan. Boil for 10 minutes stirring constantly. Stir in pectin and boil hard for 1 minute. Remove from heat and skim foam if necessary. Add green food coloring if desired. Ladle jelly into jars leaving 1/4 inch headspace. Remember to wear gloves when handling peppers! !